That schematic is so bad I can't be bothered with it. Get me a better schematic and I'll take a look. This is one of those LA768xx series jungles. I'm loathe to say if it can or can't be modded. They are sometimes locked in digital OSD mode. I, and others, have had mixed results trying to mod these. You are on the right track with the location. I would assume Pins 39 - 42 is what I want. I could do the Switch method right. SOlder wires to the raised legs of the jungle Blank R G B to the points in the middle of the switch. Solder wires to the PCB where I pulled the legs of the jungle out and solder them to the 4 points of the either side of the switch. Now what am I missing +5V right? Where would I pull that from - that gets connected to what? Scart? Also that JVC 32 inch might still be in my future.. Hoping to grab it tonight, the lady said it was gone, but now said it was pass on. So might grab that tonight. SO if you have a suggestion on how to wire all that UP. I will appreciate it. I will post pics as soon as I can. 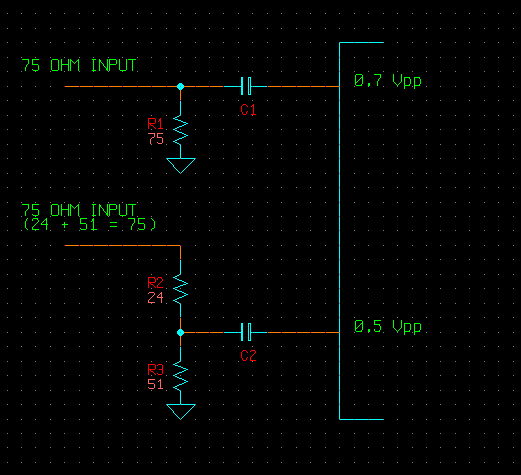 Check my new sig for the OSD external mux (mix) digram and list of resistor values. You can do it with a switch if you want a shithouse, obsolete result. Or you can check out the OSD External RGB mux method. It took me about 2 weeks to read this entire thread. Watch a bunch of videos and get just comfortable enough to do the switch method. this new method is very intimidating to me. If you are patient and not gonna yell at me or get frustrated with a noob like me asking for very general help getting this working. I will be glad to try your method. I am no electronics expert. As a modder - I have always been good at looking at tutorials and doing soldering work. Resistor values and calculations are a bit scary to me on my own, but with help I am glad to try. I did something like this on another forum with Jtag modding and flashing and was asking a ton of questions and qualifiers (like - "is this correct?") and the people there, who were helping got mad at me and said that if you can't understand what were telling you then just don't do it. Funny thing is not every one understands other people the same way. Finally I was able to get the soldering work done and the Jtag flash and software inject and reflash working and I was very thankful for those who were patient with me. I just do not want the same situation here. You all seem you know what your talking about, and I do not want to seem TOO NOOBISH for you all. Like I said above, I read and read and re-read so much that I felt just comfortable enough to even try to attempt this. So I will gladly try the new method. Just please try to help me out as much as possible if you can. I will be totally appreciative of it. I looked at the diagram in your SIG and I am already intimidated. I don't fully understand how it works. Care to try to explain it to me? 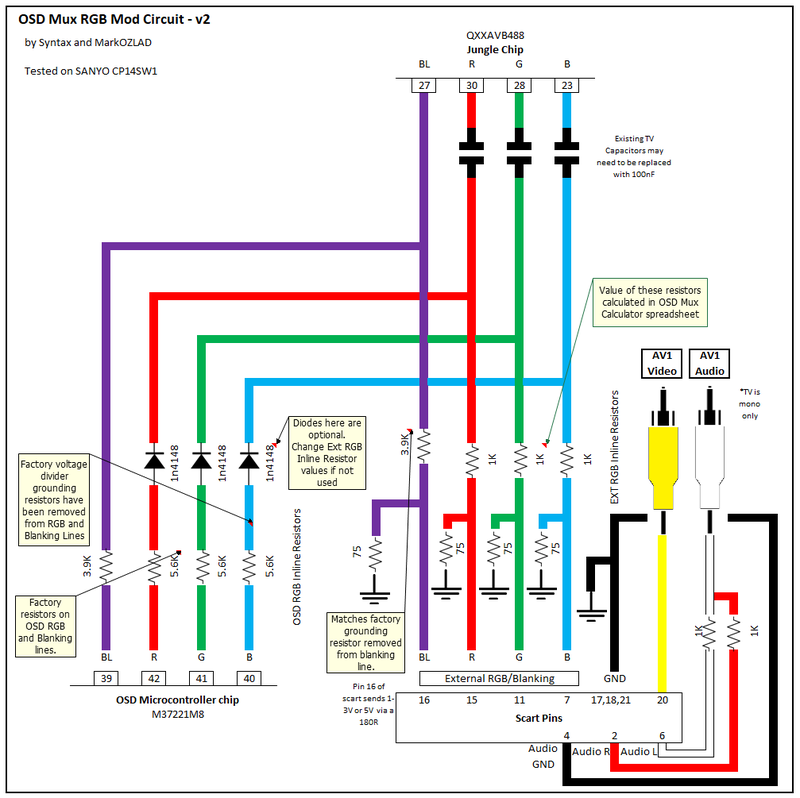 If you take the time to learn the basic concepts of the voltage divider and then study the circuits of your TV you will find the OSD Mux (Mix....) will give you a better result and actually be way easier to implement requiring less wiring. Check out this mod I got the 8 Bit Guy to do. 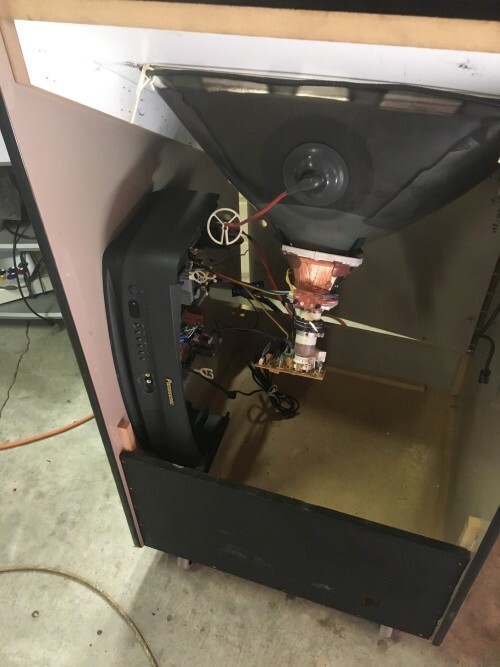 A lot of what you learned from studying the OSD snip method is good to know but it really is a big hammer approach, it's CRT RGB modding for dummies. You will still need to know how to identify the RGB and blanking lines from micro to OSD, and you will still be hijacking the OSD, you'll just be effectively "joining with the flow" instead of "diverting the river". I'm a bit anxious about your particular mod because that jungle family is peculiar, it's part reason for the shortness of my replies. Feels like a waste of time. I have a Panasonic Pv-m2048. It's a 20 inch CRT with a built in VHS and radio tuner. I would like to make a few modifications to the TV including this RGB mod. 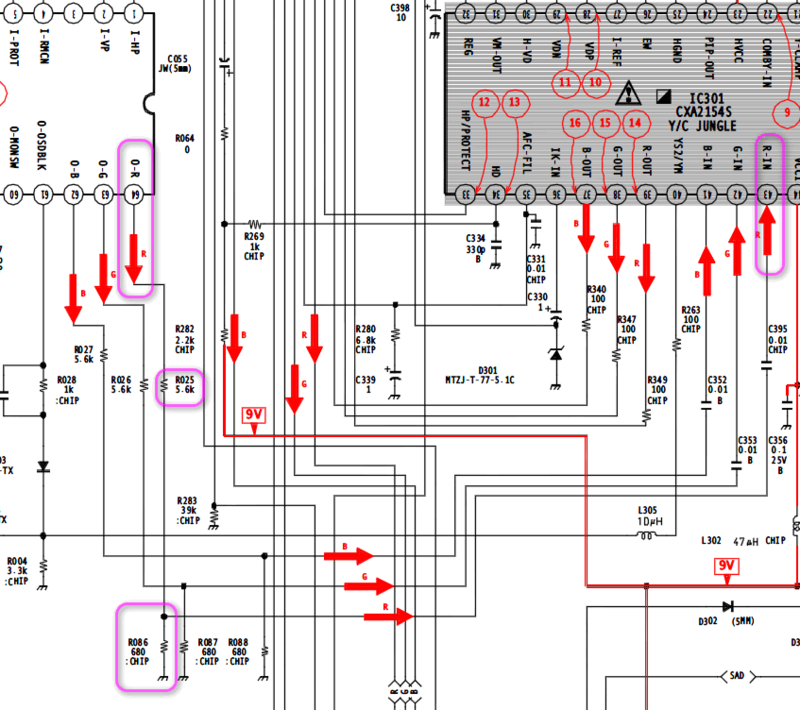 I can't seem to find the schematic however I was able to identify the jungle chip and the OSD chip as well as find the schematics for both. 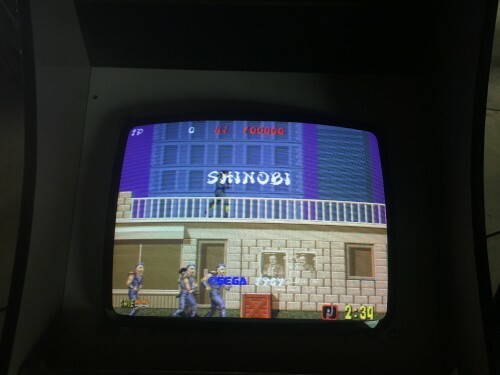 I was wondering if it would be possible (in theory) to get the sync signal from the VHS circuit inside to avoid using a composite input on top of the RGB input? If not, is there any way to add an internal sync signal? I would like to have the fewest number of connections to the TV as well as making the whole build look as clean as possible. I don't have much experience in designing my own circuits nor do I have any experience with working on analog TV's. 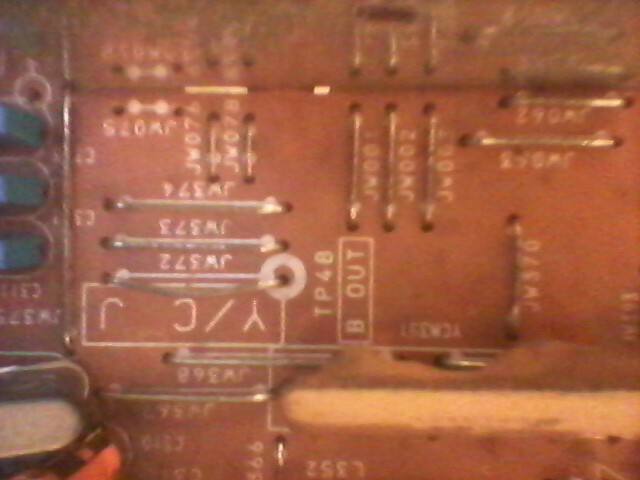 I DO have experience building circuits from a schematic and modifying those circuits using instructions from someone. As a result, any useful information I can get on this project would be VERY appreciated. The CXA1465AS jungle is one I have in my notes as taking digital RGB signals only. There was a guy a couple of pages back who said he put analog RGB into the digital pins of a Sony jungle. You might want to check that out. Nobody read my post, so I'm going to reiterate it, in a larger font. I have updated the OP accordingly. Yeah I think I’m tired from having to constantly re-educate people that the OSD snip method is mutilation and that if they do a bit of thinking they can do so much better. I think I’m going to be scarce in this thread from now. Have done my bit (with Syntax) to advance the method. Time to move on. Your input resistance should always be 75 ohms. For 0.7 Vpp just use a 75 ohm resistor, for 0.5 Vpp use a pair of resistors connected like as shown below. They form a potential divider that still results in a 75 ohm load at the input. Here's how you tell whether the microcontroller is feeding 0.5 Vpp or 0.7 Vpp video to the jungle IC. First find the power supply to the microcontroller. Usually it's 5V, but it can be lower sometimes. In this case it's 5V. 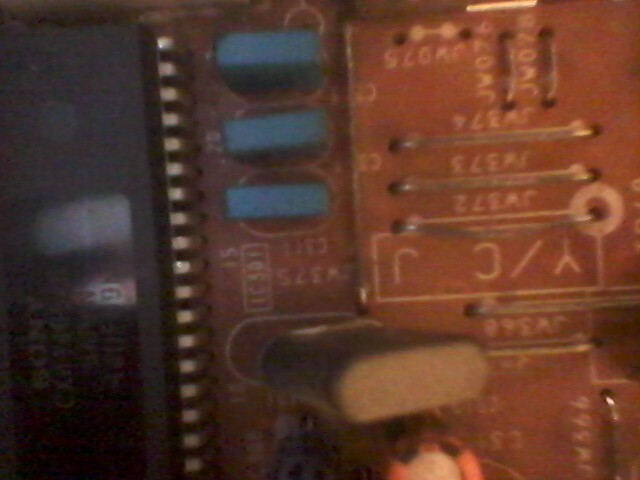 Now find the video output pins. They are digital and swing between the micro's power rail and ground - 5 Vpp signal from at the micro' pin. Find the potential divider. The resistors are 5k6 and 680. The jungle IC will see (red) O-R Vpp / (R025 + R086) * R086. In reality, the resistors will load the microcontroller output a bit so it will come all the way up to the suppl rail. 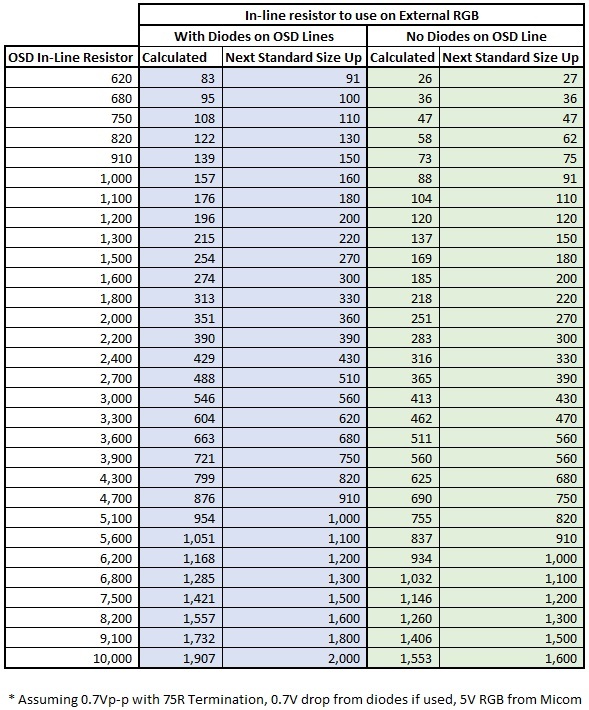 Lets say about 10% lower so it's more like 5 * 0.9 / (5600 + 680) * 680 = 0.49 Vpp. If you know the answer is going to be close to 0.7 or 0.5 it's easy to figure out which is closest. Thank you for that information viletim. Got it done but was getting a picture that's too bright. Forgot to put 75 Ohm resistors inline on the RGB lines and then it was perfect using 240p test suite. I didn't find it aggressive. I got the Sarcasm and the jist of your comment. Do not let anyone scare you off the forum. Look at the post I said to you about not wanting people getting on my case for "not getting it"
This is the same thing, people getting on your case for coming off "aggressive". I am sure you comment can be construed that way and I am sure that someone who read that comment and felt that way could be right, but at the same time, others could see the sarcasm in it. Which I think is where you were going. I got that 36 JVC.. so I am ready to MOD!! I could use any help anyone is giving out. Hoping you will not become scarce and help us all out. Looking forward to RGB on this beast!! I'm not scared of anyone or anything. Fact is my response was aggressive. I really am tired. Following lines on schematics with my eyes is getting harder and harder and I am a perfectionist when it comes to this stuff. 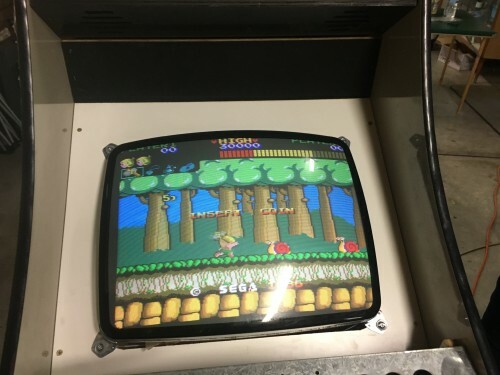 RGB modding CRTs has been an obsession for me but I actually got into this to build arcade monitors. In the last little while I finally got back to that and have got my Wonderboy lowboy running. Here are a couple of pics of it running. TV is a Panasonic TC-48M80A with an MX-5A. Mod is an OSD mux using an empty text header. 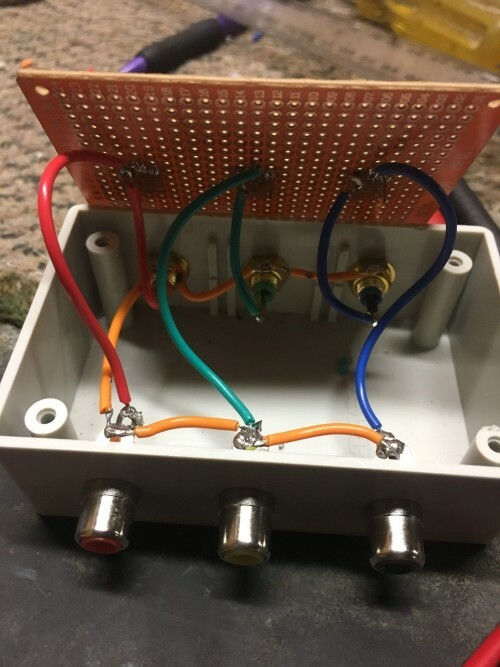 Here is the little box I built to do my Jamma to Scart video level adjustments. Note there is also a 1kOhm resistor on my sync circuit, I was able to find a jumper inside the TV which could be replaced in order to install it. The size of this resistor can vary depending on your Jamma PCB, 1K worked for me. Last edited by MarkOZLAD on Tue Feb 12, 2019 12:00 am, edited 2 times in total. Totally hope I can get RGB out of it. On quick inspection looks like it has a PIP input you can use. I'm reading along getting up to speed on the "direct mix" daewoo inspired method. I've got a handle on the math and resistor selection, I think, but my question is: without any halftone blanking of the external RGB image, doesn't the OSD end up looking rather bizarre just being directly mixed into the full brightness source image (by basically just forcing color values to "max" wherever the OSD is writing image data)? Would some kind of fast switching IC not still be a superior solution if it could be made to work properly (fixing the disparate black levels?) Or does it not matter and the OSD ends up looking fine over the ext RGB image? I've been toying with the idea of making up another VGA based PCB with a far more spartan set of components to just provide a blanking switch and footprints for a set of resistors to ground as well as in series, to allow for appropriate value selection as per the chart. Although at this point, it may just make more sense to use BNCs like this post: https://shmups.system11.org/viewtopic.php?p=1300227#p1300227 and just solder some through hole resistors to the back of the connectors. You are correct about the osd looking washed but it's still useable. Imo building an ic for perfect OSD rgb is a laugh. Problem with making a premade board is the termination resistors and clamping caps really should be as close to the jungle as possable. so does this mean you're *not* still waiting for KnuckleheadFlow's board? in all seriousness though, aren't most people utilising the coupling caps that are already on the chassis adjacent to the jungle and putting their termination resistors on the back of the input connector(s)? I would assume on the inside my TV should look the same as this AV-27260Chassis PDF states? The key thing is they are chassis “AC”. If you can’t find a schematic for your exact set you try and work out the manufacturer’s chassis number and then use that to look for a schematic. I'm thinking this is a problem for some kind of switching circuit rather than amplifier. If the micro controller sends a blanking pulse we display the OSD RGB, if not we continue to show the external RGB. That's precisely what KnuckleheadFlow's board (and the subsequent VGA-based design by TD-Linux which used essentially the same exact circuit) was designed to do. The problem was that it didn't perform as expected for KnuckleheadFlow, which I can only assume is why he abandoned the project. viletim speculated that the problem was being caused by a lack of signal clamping (DC restore) and the two RGB signals from the OSD and the external source had black levels different enough to manifest visually when high-speed switching between them. 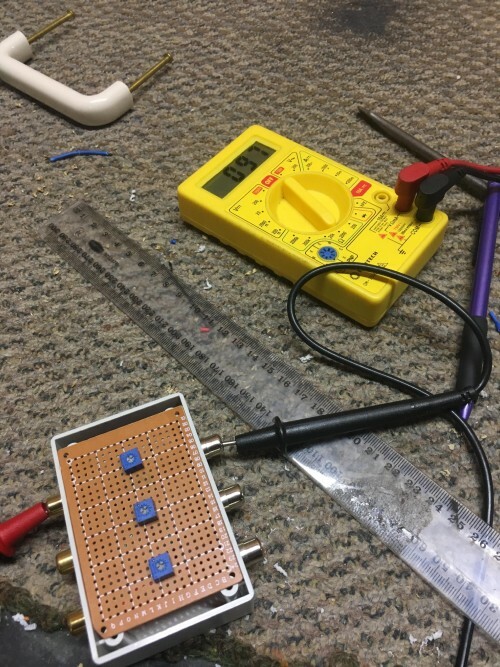 After a bit of consideration, I believe that even if the circuit was corrected to clamp properly, it would only look marginally better than what you're doing right now with the mixing. Think about it, since the RGB coming from the micon is digital in nature anyway, when the OSD is actively writing to the screen each color being used by whichever OSD pixel is just forced to max value in the mix. So the only thing gained by fast blanking the ext RGB would be the complete blanking of whichever other colors aren't being used by the OSD in the exact location of active OSD elements. In the example of white image data from the OSD, nothing would change whatsoever. Possibly would also gain a bit of a drop shadow on the letters, if the micon is programmed to produce one. This is why I am considering using the halftone blanking signal from the micon to implement halftone blanking in the entire external RGB image around the OSD while the OSD is active for a more factory look. This could be done with basic attenuation, the downside of this is it would only benefit when the full menu is open. Volume sliders and channel/input ID elements that would ordinarily display over a full brightness video signal would be unaffected. If an IC could be sourced that would accept a single halftone/full (depending on voltage level) blanking signal like certain jungles do, then a fully factory OSD experience could be duplicated. Last edited by maxtherabbit on Tue Feb 12, 2019 4:06 pm, edited 1 time in total. I found the chassis number was listed on a label inside the TV. It is a KM-208. 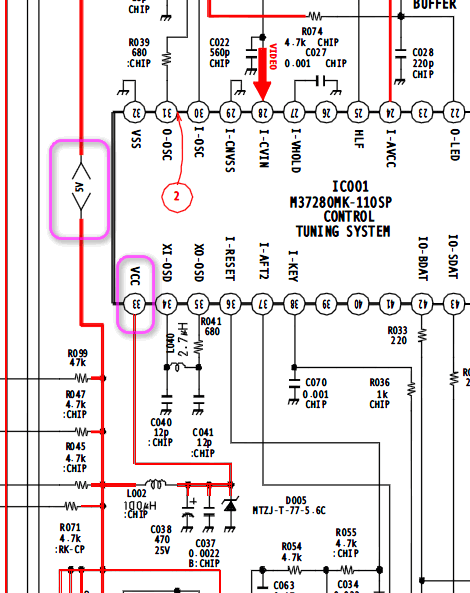 Where would I go about finding the schematic from that? I did a google searches with no results.